WELCOME BACK. 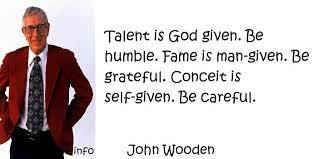 Every successful man and woman are products of the use of their God-given talent. Take your time and study any successful individual you will discover the truth in this statement. The scripture says: “Do you see a man skillful in his work? He will stand before kings; he will not stand before obscure men”. Talents is the key to financial success, and it’s a principle that can never be broken. Talent could be define as a natural abilities to do something, especially without being taught. When a person possesses some innate ability in some field or line of business, it’s said to be talented in that particular area. It’s this skillful use of your God-given talent that will lift you up to a greater heights of achievement and financial success. Look at every man or woman who is struggling financially and you will discover that they are not using their God-given talent in the market place of life. Having a talent or skill is one thing and using them to produce financial results is completely a different matter. Your talent is one of the greatest gifts God has blessed you with. After creation, the first assignment God gave man was work. Your talent will not produce by itself, it requires work to unleash its potential. Successful people value their work and focus on it, while unsuccessful people do not focus on their work. I have come to discover that one of the reasons why some people are at the top of their ladder of success and others are not is their attitude towards work. Work is the strategies by which your talent will be developed. When you make use of your God-given talent, you’re stretching it, building it, and developing it. This entry was posted in success and tagged Consistent, Encouragement, Fulfillment, Habit, Increase, Insight, Journey, knowledge, Life, Passion, Persistence, Possibility, Potential, Principles, Spiritual, success, Successful, Talent, Wisdom. Well said! In order for us to unleash our own potentials, we have to use the skills God gave us and help reach people because we will be blessed by our efforts. Thank you for this message today :).